An increasing number of cultural heritage institutions publish data online. Ontologies can be used to structure published data, thereby increasing interoperability. To achieve widespread adoption of ontologies, institutions such as libraries, archives and museums have to be able to assess whether an ontology can adequately capture information about their artifacts. 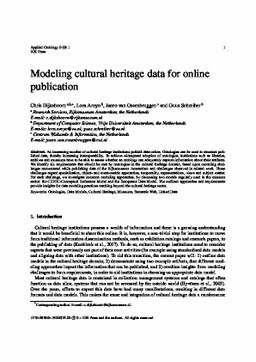 We identify six requirements that should be met by ontologies in the cultural heritage domain, based upon modeling challenges encountered while publishing data of the Rijksmuseum Amsterdam and challenges observed in related work. These challenges regard specialization, object- and event-centric approaches, temporality, representations, views and subject matter. For each challenge, we investigate common modeling approaches, by discussing two models regularly used in the museum sector: the CIDOC Conceptual Reference Model and the Europeana Data Model. The outlined approaches and requirements provide insights for data modeling practices reaching beyond the cultural heritage sector.